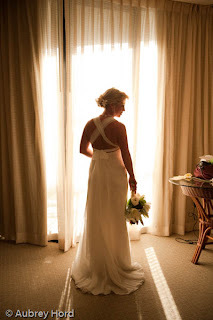 Aubrey Hord Photography: Ka'anapali Maui Wedding Photographer - Helen & Sean! Ka'anapali Maui Wedding Photographer - Helen & Sean! Helen and Sean's wedding was a terrific event to photograph and I was grateful to be asked to be part of their day! 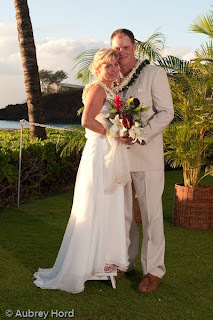 The couple decided to get married on Valentine's Day in Ka'anapali on the Molokai Lawn at Kaanapali Beach Hotel surrounded by palm trees and tropical foliage with a view of Black Rock in the background. It was a beautiful island evening with a light breeze and the ocean as our background. I had the pleasure of being assisted by talented photographers Shaina Kalama and Zach Pezzillo along with Nicole Angel on lights. Thanks team for making it a great day! Zach did a great job of capturing this image of Helen's Kissing Stool. Sean is taller than Helen and suprised the bride with custom making a "kissing stool" for her to use so they could kiss comfortably! How romantic! 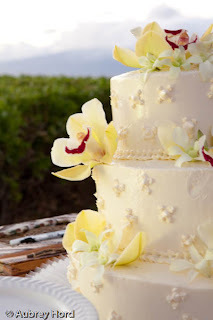 Shaina loves details and captured this image of the gorgeous cake surrounded by beautiful tropical orchids. 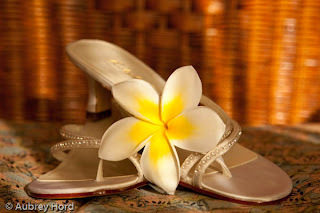 Another one of Shaina's detail shots, also creating a sense of place for the wedding with the plumeria flower. With scenic Black Rock in the background, the couple said their vows as the sun was setting on Valentine's Day. Congratulations Helen and Sean!! Hope to see you in Oregon!